Biological microscope objective lenses are available in several options. Each of these microscope objective lens options are described below. Achromat Objectives - these are the most basic high power microscope objectives. Typically the outer edge of the circular image seen through the microscope will be slightly out of focus due to the curvature of the lens. Semi-Plan Achromat Objectives - these are one step up from basic microscope objectives in that the field of view (circular image) has been corrected a bit and the outer edges will be in focus more than the standard achromat lens. However, the entire field of view will not be a completely flat and focused field - the very outer edge will still be a bit out of focus. Plan Achromat Objectives - these microscope objectives have been corrected for lens curvature and the entire image plane is flat and in focus - including the edges of the image. Plan Apochromat Objectives - these microscope objectives are also referred to as Plan Apo. These objectives have been corrected for four colors chromatically and spherically. Plan apochromat objective lenses are the best objectives to use for critical resolution and color photomicrography. These objectives typically have a shallower depth of field. Plan Fluorite Objectives - these microscope objective lenses are corrected for four wavelengths, but not quite as extensively as plan apochromat objectives are. Plan fluorite objectives are well suited for photomicrography and are typically a bit less expensive than plan apochromat objectives. 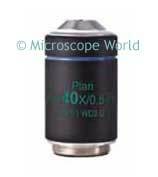 If you are looking for a specific type of microscope objective lens please email Microscope World for further information.